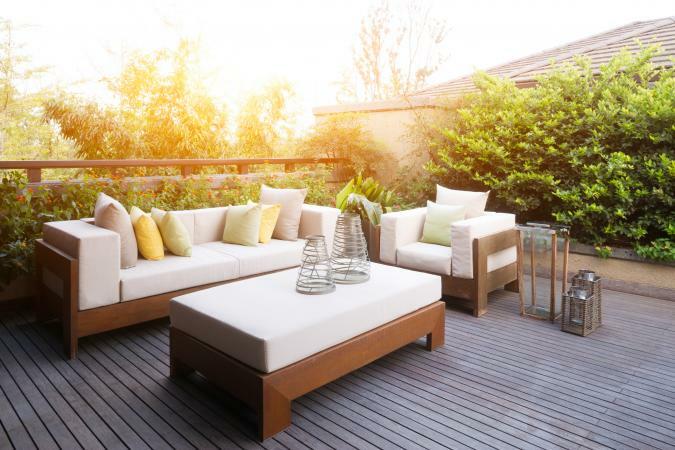 Trying to find the right brand of patio furniture for your home can be overwhelming. To find the perfect set, you'll need to know what type of furniture you want to purchase, such as wicker, wrought iron, or recycled plastics and then you'll need to research the manufacturers and their reviews. Wicker is a common material for patio furniture and can be found in most country or cottage inspired patios. While its beauty is appealing, it's important to purchase high quality wicker furniture if you want it to last. A tight-woven piece made of sturdy wicker material, such as rattan or plastics, is what you're looking for in a patio set. Sofa sectional set in grey - It costs between $600 - $1300, depending on where you purchase, for a 6-piece set that includes five sofa chairs and one table that can be rearranged to your liking. While the customer service is good at Best Choice Products, they only offer a 60-day warranty on their products, which some Walmart customers complained about, particularly one whose wicker started to fall apart after 7 months. Happy customers did mention the quality for the overall price as a standout point. Wicker sofa set black -This 4-piece set ranges from $350 - $900, depending on purchasing place, and includes a double sofa, two single sofas and a table with tempered glass. There is a 60-day warranty on this product and most Walmart customers commented how nice and comfortable the furniture is for the price, while all mentioned it does take a long time - at least a couple of hours - to assemble the many pieces. Allen + Roth offers higher-end wicker furniture and sells their pieces individually versus as a set. These products are sold at Lowe's and comeswith Sunbrella cushions, which is one of the leading brands in performance fabrics for outdoor upholstery. Pieces come with a 5-year limited frame warranty and 1-year limited fabric warranty. Sea Palm's collection conversation chairs - This conversation chair set is approximately $380. The two chairs fit together nicely and offer several layout options for your patio, especially when combined with other pieces in the collection. This furniture is well-made and many customers have commented on the versatility. Netley brown conversation chair - This brown steel frame chair, which is actually a rocking chair, is wrapped in all-weather wicker and comes with Sunbrella cushions. It costs around $250. Most Lowe's customers enjoy their modern rocker, noting how easy it was to assemble, while a few complained that it did not withstand the outdoors as well as desired, so a covered patio may be your best bet for this piece. Forever Patio is more expensive than the other brands but one of the most durable and best quality you'll receive according to Patio Production's experts for wicker patio furniture. You can find this brand in specialty patio or outdoor stores or online. This company offers extensive warranties, such as seven years for the frames, three years for their wicker and seats and one year for their cushions. Pick up sets or individual pieces. Hampton dining set - The five piece, square table dining set comes in a chocolate shade with turquoise Sunbrella cushions. You can pick up the set for under $2,000 (but with significant shipping costs) at Amazon. Customers there noted both the beauty and high quality of the pieces. Leona wicker sofa - The wicker sofa, sold at WickerCentral.com, is priced around $1,300. It comes in two shades of mocha with your choice of cushion cover. Customers note that it is beautiful and that they are "impressed" with the piece. Cast aluminum, according to Consumer Digest, is becoming a dominate material for patio furniture manufacturers due to rising prices of materials and shipping cost. This light-weight, sturdy metal is used on the majority of outdoor dining sets and woven outdoor dining sets, whereas only 17 percent of manufacturers use a frame material that isn't aluminum. Biscayne dining set - Pick up a five piece dining set at Amazon. It comes in white and your choice of 42" or 48" table size. Prices range from around $680 to $730, depending on the size chosen. Customers noted the chairs are sturdy and pattern is nice, although some did mention a few chips upon arrival. Floral blossom dining set - This nine piece set only comes in white and has intricate floral embellishments in its design. It includes four arm chairs and two swivel chairs, the table, umbrella, and stand. It costs around $2,700 at Wayfair, who notes in their Manufacturer Insights that Home Styles has "a high-end look and years of use" although some pieces may require help assembling. Panama Jack is a middle price range for durable and long-lasting aluminum furniture with up to three year warranties on their products. This brand can be purchased at select outdoor furniture stores and big box online retailers as well. Island Breeze nine piece dining room - The modern style dining set is both UV-resistant and weather-resistant, with chairs that can be stacked. One customer at Hayneedle notes that it is lightweight yet sturdy. It runs about $1700 there, depending on the sales available. Island Breeze deep seated sofa - This sofa has a limited warranty that covers weld failure for a period of 7 years. The aluminum frame warranty is for a 3 year period and comes with optional Sunbrella fabric over its cushions with a warranty covering manufacturing defects for a period of 5 years. It costs around $1700 and comes in an expresso frame with white cushions. Customers on Overstock comment how sturdy this sofa is but because the cushions are white they must be covered when not in use. Wrought iron is a material that became popular during the Victorian era. It's still desired today in patio furniture. It's durable, weather resistant and easy to maintain. While it's more costly than other materials, it's still a great option. Woodard is a high-end patio furniture manufacturer that is so confident in their product that they provide a 15 year warranty on their frames along with a 1 year warranty on their fabric. They offer pieces that are woven, aluminum and iron. You can find their products at patio specialty stores and dealerships, such as PatioProductions.com and PatioLiving.com. Hamilton loveseat - The Hamilton collection offers a retro, modern feel to your patio. The frame is wrought iron and can come in several colors and shades, such as black, white or copper. Their cushions use Sunbrella fabrics and have several shades and colors to choose from, like indigo, rust and some stripped patterns. This loveseat is from $1500 - $2700 and comes with Woodard's 15 year warranty on its frame. Bradford stackable bench - The Bradford collection is a traditional garden patio style that is affordable, durable and will go with most styles. This bench is $300 - $400 and can be combined with any other brand or style to add an eclectic feel to your outdoor space. While this chair is not as comfortable as other pieces, comfort can be added with your own pillows and cushions. Wayfair gives this brand a high review putting it within their "Cherished Heirloom" category. Alfresco Home offers a wide-range of quality patio furniture along with wrought iron dining sets. They have more contemporary to modern pieces but at a higher quality than other patio furniture brands. The Family Leisure blog notes that their mosaic dining tables are the "main attractions." Orvieto oval marble mosaic dining set - This set costs less than $5300 at ShoppersChoice.com and brings a modern, eclectic feel offering more design options for your patio. It seats six and to clean the top, all you have to do is hose it off. Pointe mosaic bistro set - Pick up the three-piece set from PatioShoppers for around $1,000. Small enough to be moved easily, you can set up your dining area just as desired. Steel frames are durable and weather well but not as sturdy as aluminum. This material is normally combined with other materials and is therefore more affordable. While it's not as desirable as cast-aluminum there are some sets that look nice, last a few years and will be easy on your budget. Castlecreek has an assortment of inexpensive, easy to obtain patio furniture made of steel and canvas that will fit in most budgets. While this furniture is reasonable it doesn't have the same quality and longevity as other brands. 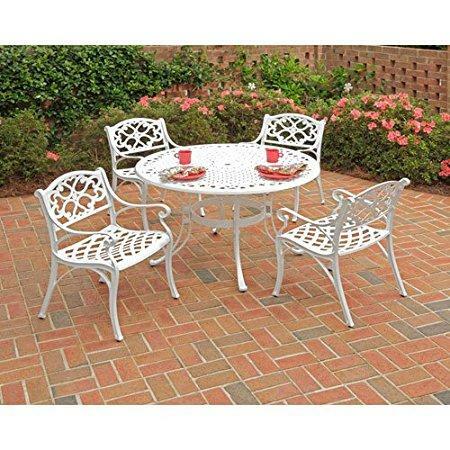 Complete patio dining set - This six piece set is a powder-coated steel-frame priced at around $160. Many consumers on Amazon are happy with the product, particularly the price, but some did mention that the umbrella was not the same color as the material on the chairs. Shale Island 8-piece patio dining set - This set from Sportsman's Guide runs less than $400 and includes a dining table, side table, two swivel rockers and four stackable side chairs. Its powder coated steel frame, glass top and weather-resistant fabric is comfortable and stylish. Customers were happy with the price and how easy it was to assemble but some thought the same product could be purchased at a department store to avoid shipping cost. Azalea Ridge 4-piece patio conversation set - This four piece set is made of a combination of wicker and heavy-duty steel frame, priced at a comfortable $600. According to 10 Top Rated Review's extensive product evaluation and comparison this set was the best selling product within its category. The appearance, durability and comfort, along with the price, make it an ideal purchase for your patio. It comes in burnt orange and green. Fairwater 4-piece conversation set - This set, available at Walmart, has a modern feel to it and is reasonably priced at $520 for the entire set. It's constructed out of steel frame and woven elements. Most customers like the cushions, look and price of the product, while some complained it's not easy to assemble. Teak is the hardest, strongest and most durable hardwood found in large deciduous trees native to India and Southeast Asia. It's the ideal timber used for shipbuilding and patio furniture. Teak provides a beautiful, warm wood finish that's easy to maintain, it's water-resistant, bug-resistant and can last forever. Harmonia Living creates beautiful modern teak patio furniture that is well-made and durable. They also have lines of wicker and cast aluminum pieces. Patio Productions reviews the brand as an affordable alternative to higher end options. Sylvan teak dining set - This seven-piece dining set from StonecrestFurniture.com costs around $2,200. The furniture is well-made with dove-tailed joined edges, a 2 year warranty on the frame and 5 year warranty on the fabric. Ando sofa set - This sustainable harvested teak 4-piece set retails at $4,500 from Skylar's Home and Patio. It comes with Sunbrella fabric cushions. Its modern, classic appearance will outlast many design styles and its high-quality materials and construction will outlast outdoor wear-and-tear. Some furniture manufacturers use plastics to provide durable and beautiful pieces of furniture that last forever. This furniture is made of high density polyethylene, which is recycled from milk jugs and water bottles. Poly-Wood is an American company inspired by the outcome of government recycling programs. They engineered polywood using recycled plastics and developed patio furniture of all-weather endurance, improved aesthetics, and durability. Sierra Trading Post reviewers mention the quality and durability of the brand overall, though they note pieces can be heavy and the white pieces may need additional cleaning. Palm Coast Adirondack folding chair with hideaway ottoman - This chair from AuthenTEAK is a popular beach-side patio style costing about $470 and comes in several color options. It's very durable, easy to clean and the company provides a 20 year limited warranty for residential use. Harbor deep seating chair - This collection is simple and modern but has some traditional aspects that keep it versatile and usable in many design plans. 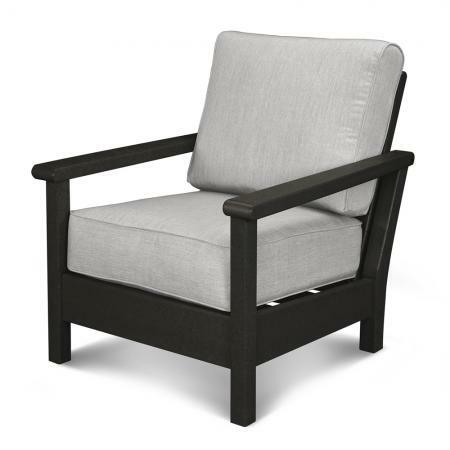 The seating chair retails at $925 at ATGStores.com and is made of the same sturdy polywood and comes with Sunbrella fabric cushions. Breezesta is another USA-based company that uses recycled plastics and forms them into durable timber, creating appealing patio furniture. They carry the same Adirondack collection like other recycled plastic furniture companies, but they also have a broader selection of different designs and styles. Pieces come with lifetime warranties. Coastal Adirondack chair - The Adirondack chair, available from Breezesta Direct, costs around $400. It comes in 20 different colors and has a lifetime warranty. A customer commented that s/he plans to purchase more in the future. Coastal bar chair - Pick up the coastal bar chair from Polyfurniture for about $500. A customer notes they are easy to clean and "don't get too hot" when placed near fire pits. It may be time consuming to find patio furniture but comparing some pieces and reviews will help save you some time. While not exhaustive of all materials and companies, you're sure to find some popular patio furniture styles and new outdoor furniture ideas that will not only provide your outdoor space with beauty and comfort, but allow you to enjoy it over many social gatherings with family and friends.